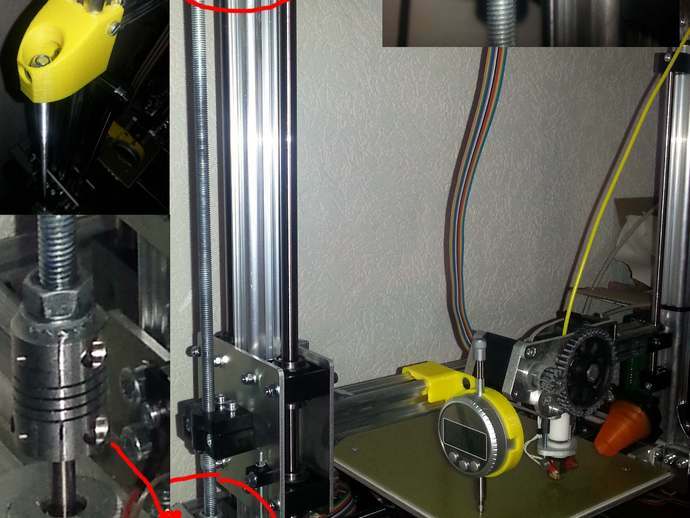 Roland Hoffert, from www.eytec.de, submitted us this 3Drag (Velleman K8200 version) hack to improve the z-wobble issue, one of the most known problems affecting the RepRap family printers. Roland identified one of the weak points that could cause the z-wobble in the fixed coupler of z-stepper motor. With the standard fixing, when the z-stepper moves the z-axis rod it starts shaking and this unwanted movement pushes the z-axis up and down, causing the wobble. As a solution, Roland replaced the coupler with a flexible one; the elastic support absorbs part of the rotational force and stabilizes the z-axis. In addition, also the top z-axis holder has been replaced with a more stable one, in order to absorb better the vertical vibration. This hack is necessary since the flex coupler is a kind of preloaded spring and it couldn’t keep the weight of the arm and axis itself. Here you can find more pictures and the downloadable project. You can still provide your submission to our 3D Contest!